Thousands of wells require 10,000-psi rated frac plugs that can be installed in the wellbore so that cluster perforating operations can be carried out prior to hydraulic fracturing. Today’s operators can select from myriad low-cost composite plugs that are milled after the fracture or from several types of higher cost plugs composed of materials designed to dissolve at downhole temperatures in a variety of completion fluids. Interventionless frac plugs transformed plug-and-perf efficiency and enabled record setting treatment depths by eliminating post-frac drillouts. But when interventionless downhole tools leave obstructions in the wellbore or restrict access, they can also complicate operations—now, and later. 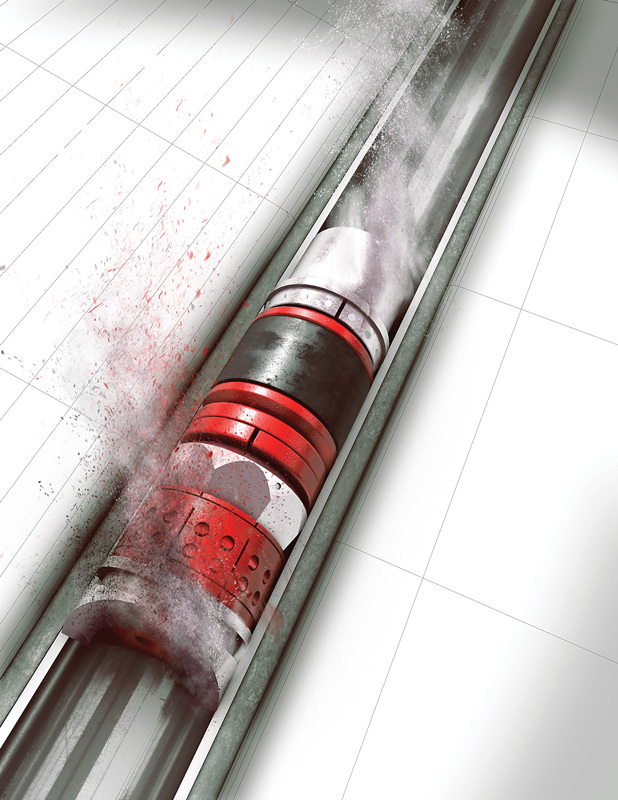 The ideal solution: A frac plug that completely disappears downhole after fracturing. Standard frac plugs use cast-iron slips and rings or ceramic buttons, coupled with a packer, to create a tight engineered seal and hold plugs firmly in place. But some of these high-strength materials are nondissolvable, and materials that easily disintegrate in wellbore fluids are usually low in mechanical strength, and may disintegrate too fast. The challenge: Mechanical strength, engineering seals, and integrity—and total disintegration. Combining seemingly incompatible properties into a single tool can be accomplished with advanced materials science, unconventional engineering, high performance design, and an unrelenting commitment to delivering what operators need. Dissolvable plug-and-perf systems use degradable plugs instead of composite plugs to isolate zones during stimulation. The versatile system is suitable for cemented, uncemented, vertical, deviated, or horizontal applications in shale, sandstone, dolomite, and other lithologies. The material degrades completely and predictably within hours or days, ensuring that production reaches its full potential. Fullbore access also increases the options available for postfracturing evaluation and future production optimization and intervention. No plugs means no mechanical intervention is required to mill them out. Running the dissovable plugs eliminates the need for the tubing- or Coil Tubing-conveyed perforating gun to fracture-stimulate the first stage of a plug-and-perf operation. The result is reduced expenditure of time and money. Operations are possible in remote locations with no access to mechanical intervention units. The lateral length is restricted by the capabilities, costs, and length of Coil Tubing for effective milling. Eliminating postfracturing CT intervention removes limits on the length of the lateral, maximizing reservoir contact and estimated ultimate recovery (EUR). In depleted reservoirs it is difficult to manage the removal of milling debris, increasing costs and the risks of getting stuck. Rigging mechanical intervention equipment up and down carries its own risks. Eliminating milling considerably reduces the time between drilling and production. On multiwell pads by the time drilling on the pad is complete, the first wells are ready to flow back and be placed on production, providing faster access to revenue. Research conducted with 10 U.S. operators and consultants who have expertise in plug-and-perf (PNP) completions reveals composite fracture plugs have a proven track record of continuous improvement in pumpdown speeds, drill-out time and water usage. Dissolvable plugs, however, have not yet lived up to their initial promise to reduce the total cost of completion operations, and some experts are skeptical of claims that these high-tech downhole tools always do disappear without impeding flowback or production. Composite fracture plugs have been used since the late 1980s. Initial composite plug designs were based on legacy cast iron bridge plugs installed in vertical wells that were completed in one or two zones. The first plugs had many component parts, including cast iron and tungsten components and metal rings, in addition to the composite material, which was frequently made from layered sheets of composite. With the advent of multistage horizontal fracturing, easily drillable composite fracture plugs became essential components of unconventional well completions. Operators and service companies with experience in U.S. shale plays estimate that 80% of wells are completed in stages using the PNP method. A plug, setting tool and perforating gun string are lowered on wireline and then pumped down into the well; a plug is set, the stage is perforated in several places called clusters, and the wireline is removed so pumping operations can commence to fracture through the perforations into the adjacent rock. This process is repeated a few times in a vertical well and from 20 to 70 times in a horizontal well. After the fracture the plugs are drilled out with a bit on jointed pipe or by coiled tubing (CT) with a downhole motor and bit. The debris from the milling operation is circulated out of the well, and flowback and production begins. For efficient PNP operations, the plugs, setting tool and guns must be run quickly without “presetting” before reaching target depth. Water volume and horsepower for pumping the plugs downhole should be minimized. Plugs should hold 8,000 psi to 10,000 psi during fracturing. To minimize overall completion costs, the plugs should drill out quickly and leave only small cuttings that do not cause the CT to stick so that time-consuming short trips are minimized. In the past few years a few composite plug suppliers have improved their designs to meet these goals by introducing shorter plugs with better composite materials; fewer parts and less metal content; and fluid propulsion rings that accelerate running times, minimize or eliminate presets, improve pressure ratings, and reduce drillout time. In one operator’s wells studied in the Permian Basin these improvements have reduced PNP and fracture completion times from eight days to four days. Completion engineers and consultants said high-performance plugs require less water and can be safely pumped down at speeds exceeding 24 m/min (80 ft/min) without risk of a preset. Drill-out times with these plugs are highly predictable and range from 7 to 12 minutes per plug.